Hey guys! 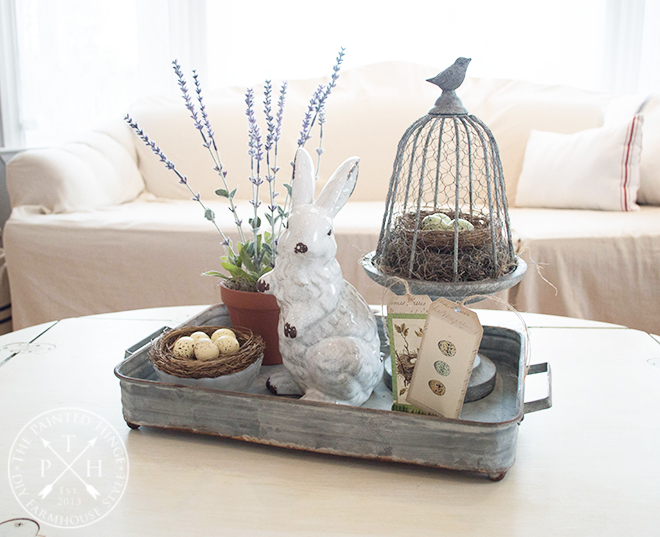 Welcome to the Vintage Easter Joys blog hop hosted by Amber at Follow The Yellow Brick Home. 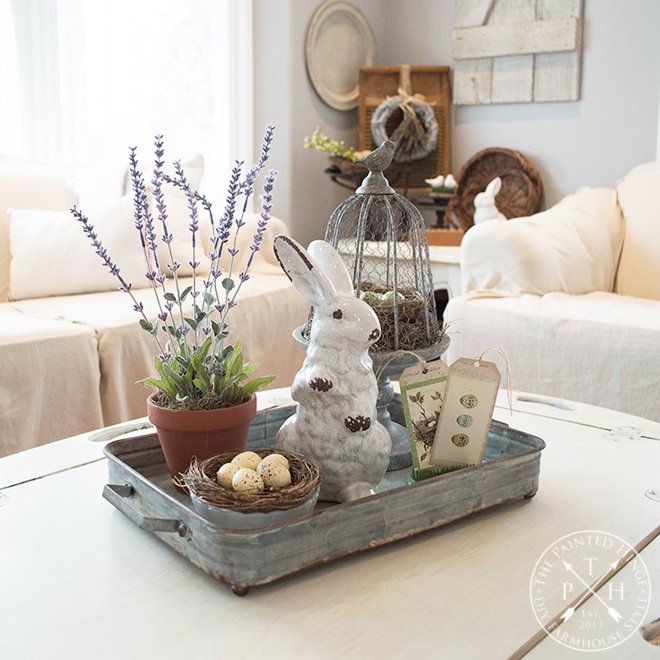 If you are coming over from her blog, I am sure you were bedazzled by her lovely home and amazing Easter decor! 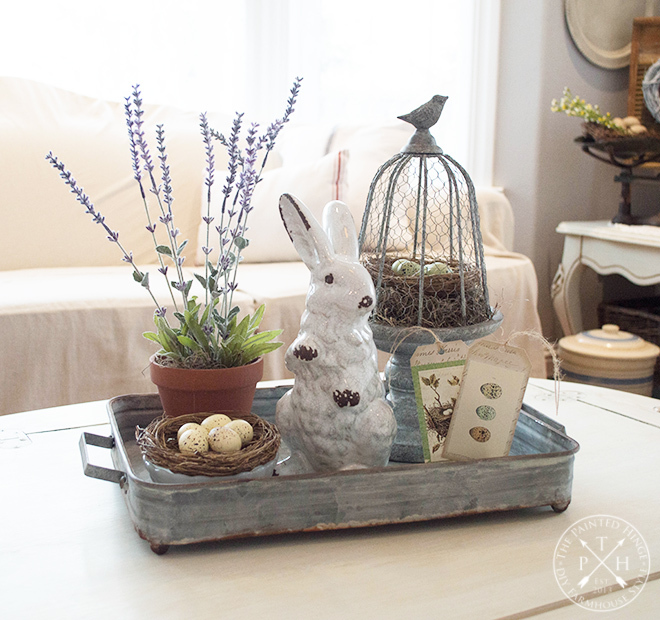 Today I’m sharing a Easter vignette on our entryway sideboard, a coffee table centerpiece in our living room, and our hutch that I decorated up for Easter in our family room. 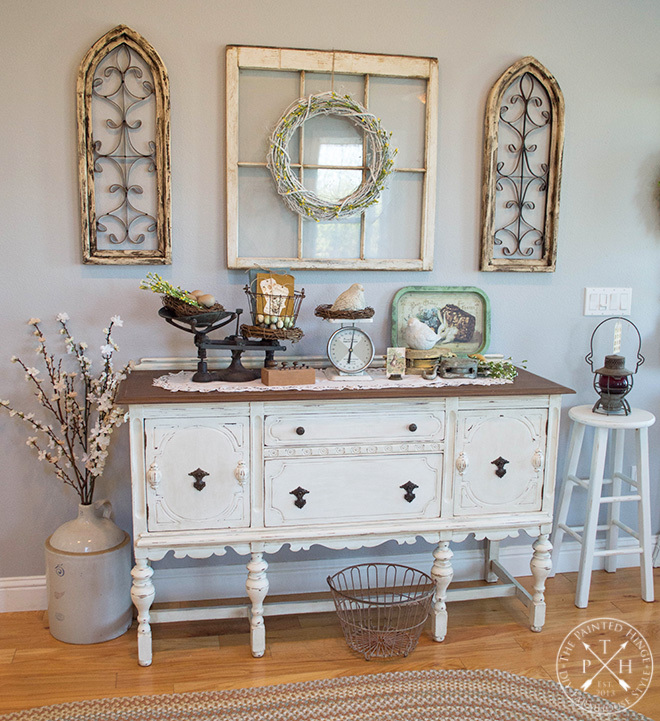 I love our entryway sideboard as it is so fun to decorate up for the seasons and holidays! I didn’t notice it until after I finished decorating, but I seem to have a scale theme going on here. This is a candy scale that my late grandfather had. He used to frequent flea markets (we have that in common) and he more than likely got it there. The wood “brick” holds the counterweights that was used with the scale. 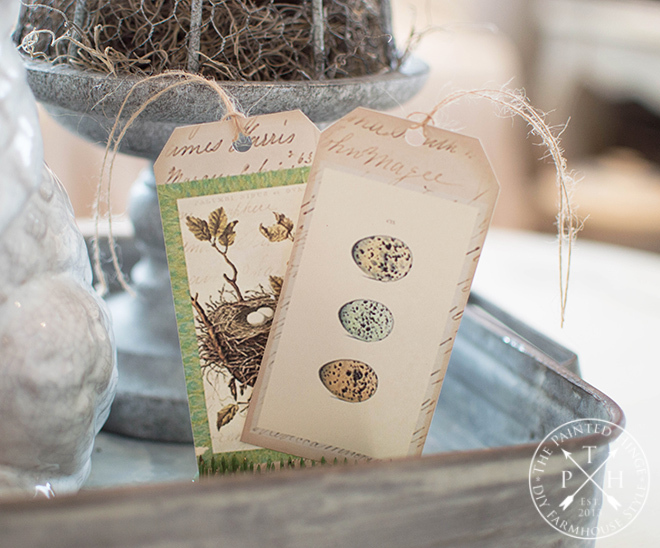 I used some 8″ grapevine wreaths, an egg basket, some plastic and paper covered eggs I bought from JoAnns, artificial spring blossom sprigs, and old books tied with twine and some cute free printable tags from Lilac & Lavender. 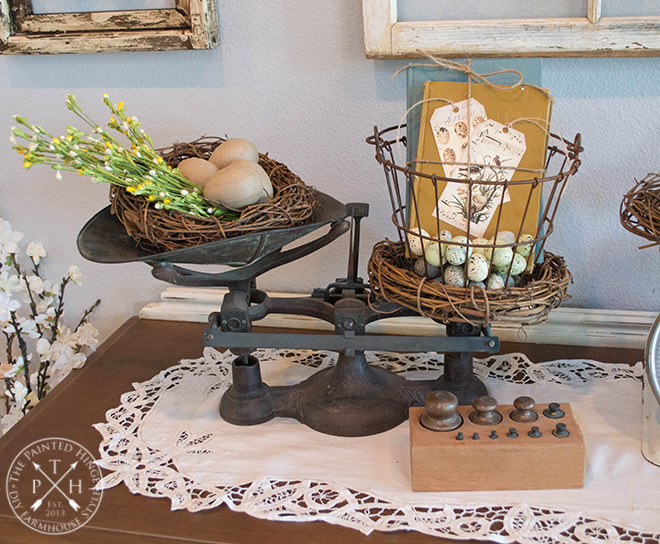 One of my vintage kitchen scales, some pulleys I got from a cousin, a couple of ceramic birds and a vintage reproduction Easter tray I bought from Amazon, a couple of ceramic birds I bought from Hobby Lobby, more artificial spring blossom sprigs, and a vintage Easter card stuck in a flower frog completes the vignette. 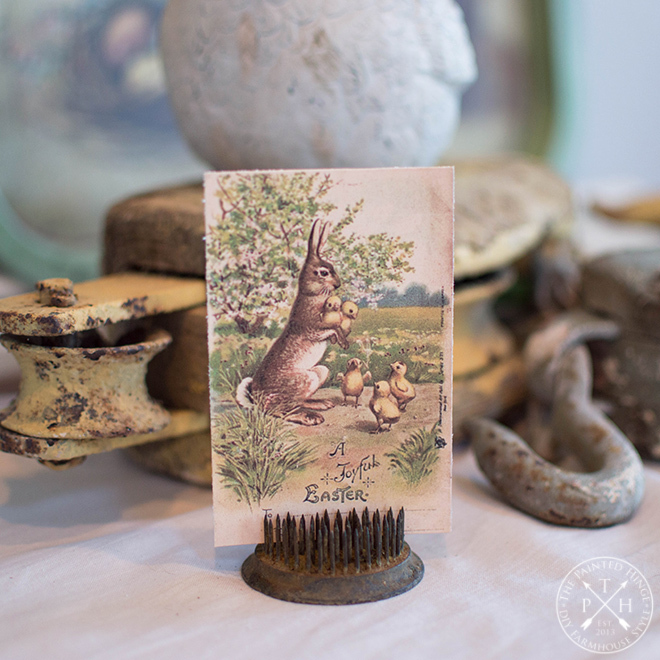 I have a thing for vintage flower frogs, especially the spiky ones that I can stick things into like this vintage Easter card. This hutch is in the corner of our family room next to our entertainment center. When I bought it from one of my cousins, I was painted a deep brick red. It was pretty in red, but it didn’t fit our decor so I painted it and I’m very happy with the results. I also love that it’s a corner hutch and it fills this space perfectly. 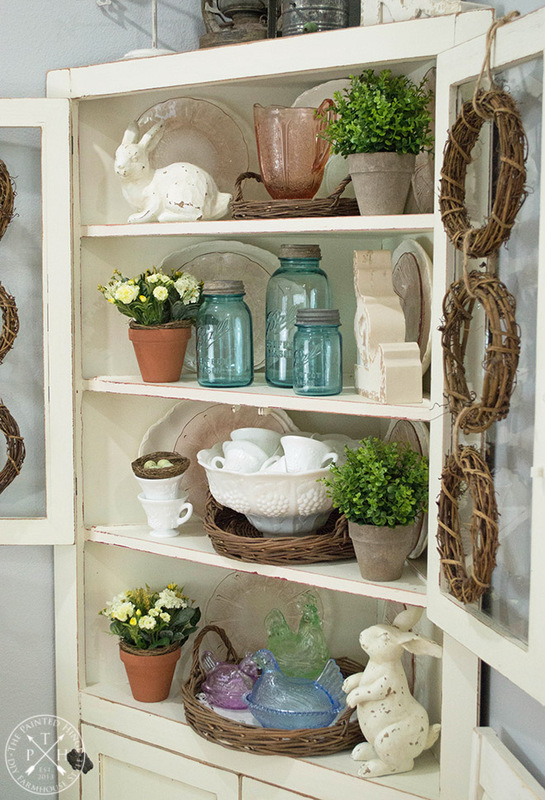 I know a lot of you guys are probably thinking “it’s too busy!” I don’t always put this much stuff in this hutch, but I like to mix it up a bit, especially with all the fun pastel colors I get to play with for Easter decor. I also like to put out as much flea market finds as I can at any given time, or they just stay tucked away in the back of one of our closets, and what fun is that? The wicker basket set I bought at Decor Steals. 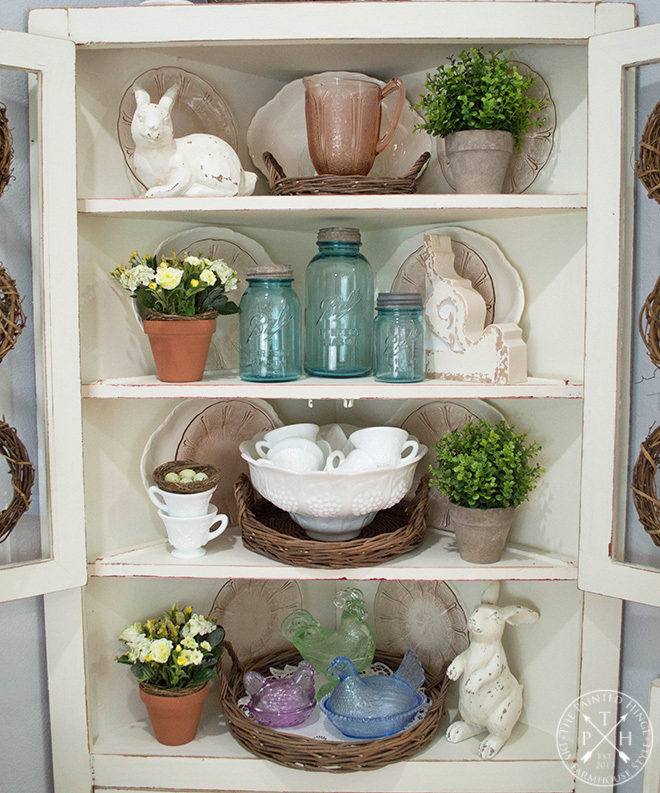 The distressed wooden bunnies, plastic eggs and artificial floral sprigs I bought from Hobby Lobby. The grapevine wreaths, nests, and potted artificial boxwood plants I bought at Amazon. Everything else I got either at flea markets or from my late grandparent’s estate. Last but not least, our coffee table in our front room. I bought the bunny last year at JoAnns. I checked this year and they didn’t have it again. 🙁 I bought the chicken wire cloche on Amazon and the lavender springs at Hobby Lobby. As I’m sure you can tell, I’m totally in love with these tags! 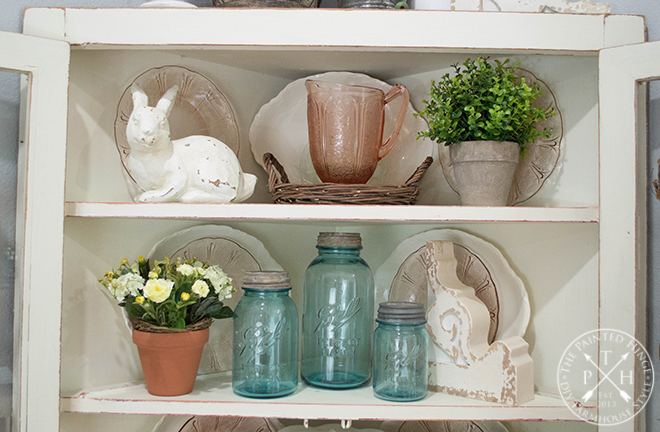 I hope you enjoyed my farmhouse Easter decor ideas! Next up is Kristen at White Arrows Home. You will love her gorgeous rustic cabin style! Thank you so much for checking out my farmhouse Easter decor ideas and enjoy the rest of the hop! 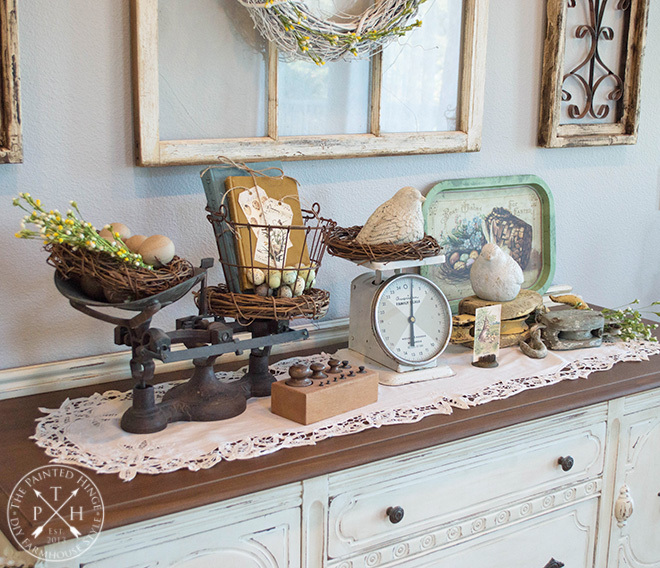 You have really put the Farmhouse style in your Easter decorating…..great job! Have a blessed day……hugs! Your decorating is lovely, Michelle! Your grandfather’s scale is a treasure! 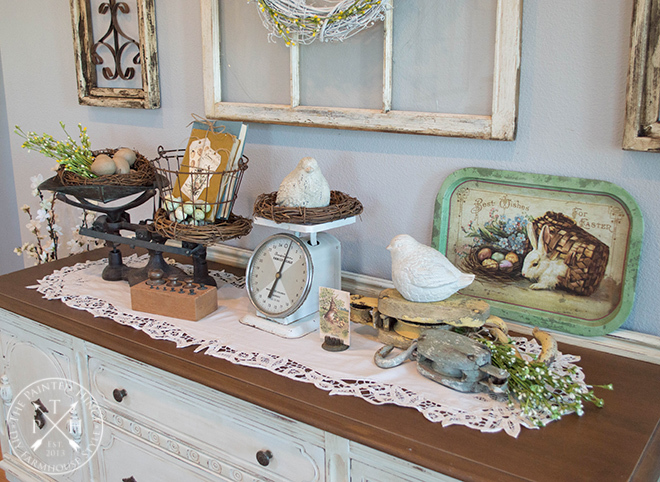 I just love the scales on your entryway table and those sweet birds! 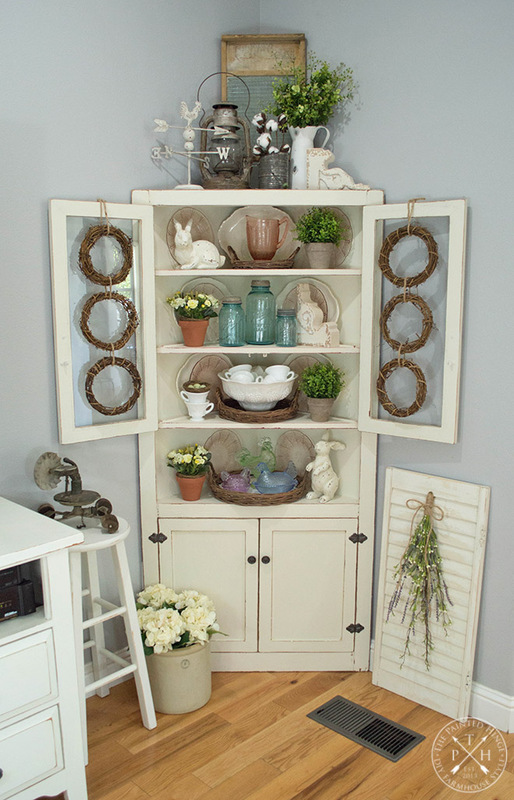 Your hutch is styled so perfectly! I was taking mental notes!! Thanks for the inspiration!! Love it all! Fun hopping with you! Michelle, I love each and every little thing! We have so much in common. I love scales, pulleys, and aqua bottles! Also love farmhouse style, but must admit it fits better in my basement than upstairs. Still, I incorporate it a bit. The corner hutch is perfect and filled just perfectly, if you ask me! I certainly enjoyed my visit today!! 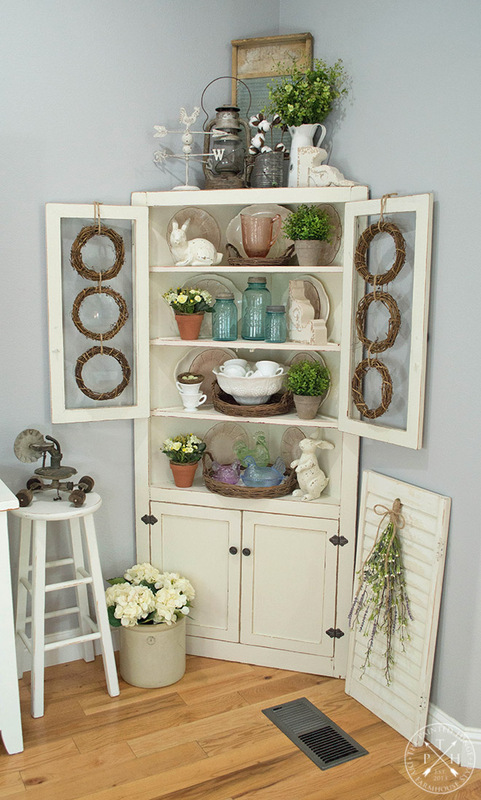 I love how you styled the corner Hutch, Michelle! It’s so lush with the pink, aqua and green & the contrast of the rustic-sheer perfection! there is no “its too busy” in the vintage lovers vocabulary!! I love your cabinet and that wonderful metal tray filled with great Easter goodness! 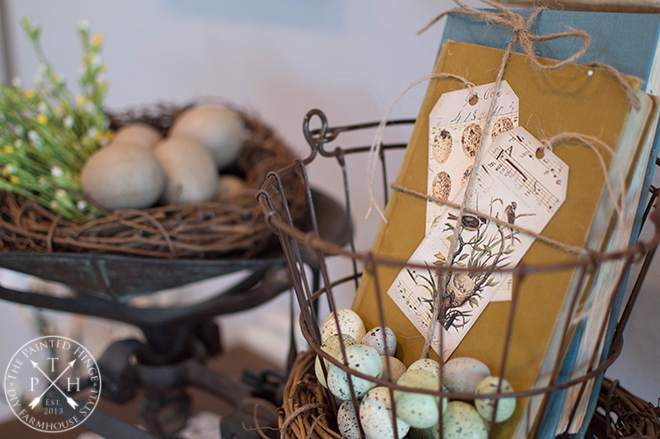 That vintage Easter postcard is so adorable in that flower frog! I love your cabinet full of your Easter goodies in the corner and of course the sideboard is splendid too! Your Easter decor is beautiful. Love the scales. 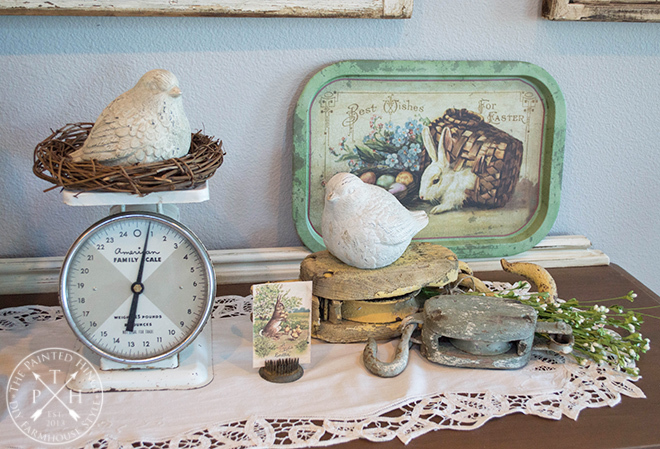 What fun vintage finds you have to use in your decor, Michelle! I love the candy scale you have from your grandfather! And isn’t it funny how you discover the sudden themes and collections once you start pulling your things out? You are ready for spring, and it was delightful seeing your style for the season. Happy Easter! Michelle, it was treat to visit and see your vintage style. I especially love that you have your grandfather’s candy scale. 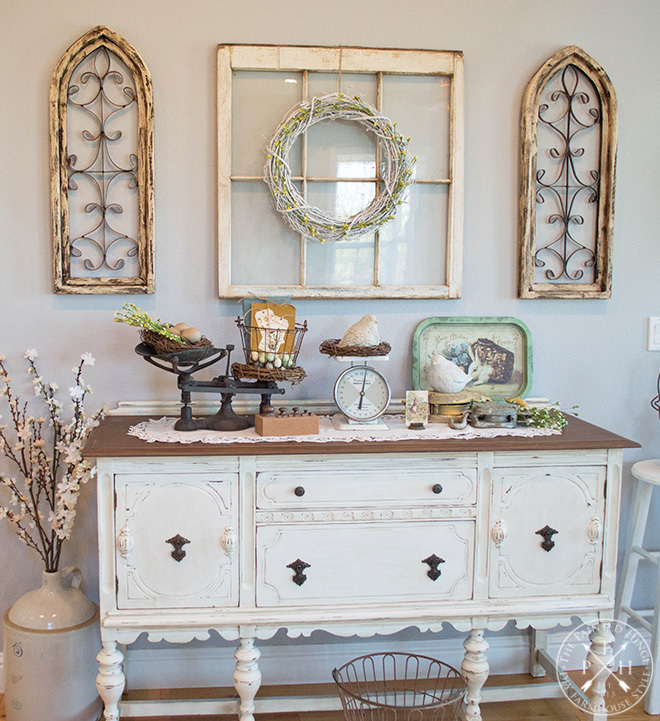 Your buffet and corner hutch are both great pieces for decorating seasonally. Isn’t it funny how we see themes and find we have unintentional collections once we pull our things out? 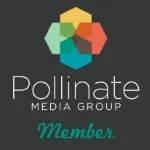 It’s a love for vintage that is the common thread of our community, and a great thing to share. Happy Easter! I loved your hutch; I will never be a minimalist; must have a bit of a Victorian in me somewhere!! 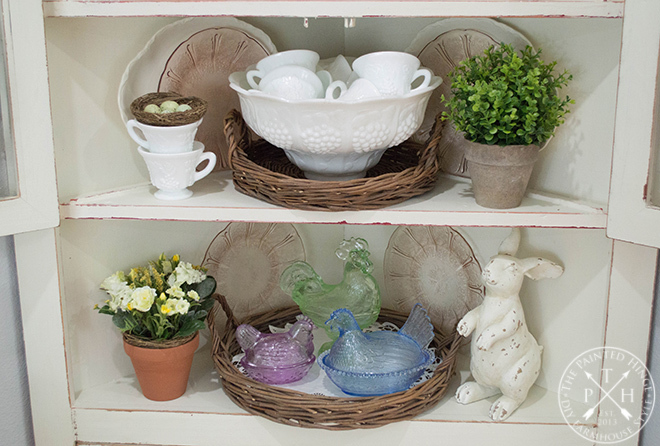 I have several milk glass hens and loved the colored hens and rooster on your bottom shelf. You did a lovely job arranging all your treasures. Happy Easter! I am so in love with every one of your incredible photos and everything in each one. Those tags fit ight in with my living room an bedroom. Was only able to print them out in smaller size as am terribly digitally challenged but am so happy to be able to print them at all. Am being heavy on a nest theme. The tags will be used as a banner for to start with. Thank you so much for tags, love them. Thought I was mostly cottage gal but guess farmhouse is part of my loves, cottage farmhouse? Printed out some of my favorite pages with vignettes I want to remember.